I have fun with lobster. I really do. Like last summer when I decided to play with a pair and some garlic scapes. 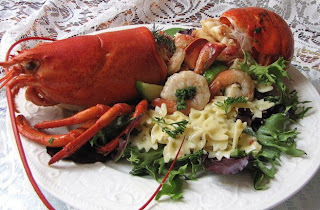 This was a treat, lobster, shrimp, bow tie pasta, and olive oil. So after having a chat with my good friend, Dewey, I had the fever to make a lobster omelette, but didn't want any cheese to cover up the delicate flavors of the succulent meat inside. So what is one to do? How about a basic white sauce? Sounds good to me! Melt butter in small saucepan over medium heat, add flour and stir till bubbly. Then slowly pour in milk. Add seasonings to your taste. 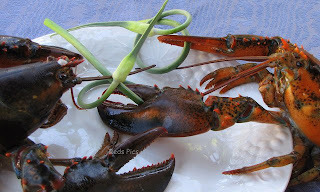 ( salt, pepper, small amount of garlic powder, chives, a dash of tarragon) Remove from heat and add chopped up lobster. Pour into eggs and add a few sauteed mushrooms if desired. I served with roasted fingerling potatoes and avacado. I hope I gave you some inspiration, and also wish all of you a wonderful weekend. Wow!!! I think that says it all! Really amazing Kim! Wowzers, this is an impressive omelet! I could never boil a lobster, but they sure are delicious. That looks really delicious. Lobster is one of my favorites! It's breakfast time now and I wish I had a plate of that sitting in front of my now!